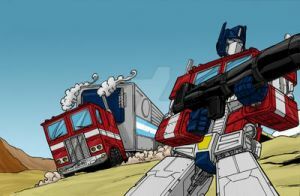 A tribute to those wonderful voice actors who have voiced Optimus Prime. I chose these specifically so don't comment that I "forgot" a certain incarnation. I didn't "forget" anything. Isn't David Kaye the voice actor for transformers Armada, Energon, and Cybertron Megatron? Really? I didn't know he voiced them. Oh Awesome! and when you finish Transformers Prime Optimus Prime he can join too XD. Great work my friend I love your art. Ugh, personally I thought RID Prime sucked: his monotone voice, his normal form composing only the"Cab" section of a fire truck, his naivety when it comes towards his enemies, and his parts-forming "battle-mode". As for BW Primal and TFA Prime, those two look badass! Is this even your final form!? Ity is what I think where you got your inspiration from. ah slag, you beat me to it! It's funny how Neil Kaplan was born in my hometown. I think I know why you chose them because some "certain incarnations" were played by the same guy. You should do one with all of the Primes from the different shows.